When you’re pregnant with your first child, your to-do list probably reads more like a girly weekend of shopping, relaxing and being pampered. With your second pregnancy, you probably haven’t even found the time to write a to-do list, never mind get that pedicure you’ve been after. Well don’t worry, we wrote one for you. If you’re about to go from a family of three to a family of four, it can feel like a huge leap. You’re probably worrying about how your first born will adapt to her new position as oldest sibling. 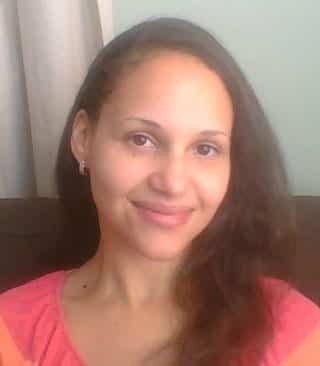 Will she love the new baby or will she resent the baby for hogging all the attention? Think about the huge emotions you’re feeling about your first born becoming a big sister and then multiply it by a million, and you’re probably still nowhere near understanding how she really feels about the changes afoot. One thing’s for certain, your big kid deserves your undivided attention for a little while. Don’t worry, you don’t have to let her cut your hair or take charge of your bank account, but offering reasonable decision making rights might do your child the world of good. Put her in charge for a day. Let her choose what you do: it could be a trip to a theme park, a picnic in the garden or going to see a movie at the cinema. It’s totally up to your biggest child. Let her be in charge of everything. And if that means you end up eating cookies for lunch, then so be it. After all, this is for one day only. Your child will have the time of her life (hard not to with all that sugar) and will remember her special day for years to come. Remember, you have to enjoy it just as much as she does, so make sure you’re excited too. No matter how old your child is, life will be easier for you both if she has a little bit of independence when the baby arrives. For a toddler, this could mean having access to a snack cupboard throughout the day. Keep the cupboard topped up with healthy snacks and let your child choose what she wants to eat whenever she’s hungry. She’ll enjoy making the decisions and it will make things easier when you’re trapped under a feeding baby in a few months’ time. For a slightly older child, now might be a good time to encourage her to dress herself in the morning, or wipe her own bottom after using the toilet (the holy grail of parenting). The term ‘baby’ is often used to describe newborn babies and recently waddling toddlers. This means your child could have unrealistic expectations of what the new baby will be able to do. If she sees toddlers pottering about, playing games and chatting, she might assume the new baby will be able to do all of that as well. In fact, newborns are pretty boring (not to you, obviously; you could stare at those perfect little fingernails all day). Help to prepare your child for the reality of having a newborn baby in the house by spending some time around newborn babies. During your first pregnancy, your babymoon probably consisted of romantic moonlit walks and candlelit meals with your loved one. This one will be less romantic but hopefully just as enjoyable. You won’t be a family of three for much longer, so it’s important to make the most of these last few months together. Book a little getaway – just for the three of you. It doesn’t have to be anything huge or expensive; it could just be a short break not far from home. The important thing is that it will allow you to have quality time as a family. You’ll be able to create some wonderful family memories and enjoy some time away from the distractions of everyday life. Kids are naturally very inquisitive and your child has probably already inundated you with questions about how the baby got in your tummy and how it’s going to get out of there. Try to be as honest as you can when answering these questions. Prepare your child for the birth of baby by educating her about what to expect. Even if you’re not planning to have her there during the birth, your child might be present when you go into labour so she might witness some of the contractions. She’ll also probably see you soon after the birth, so you’ll need to prepare her for that as well. Children often worry about things they don’t understand and birth is one of those things, so prepare your child for the birth by giving her as much information as you feel comfortable with. BellyBelly recommends these 7 books to prepare your children for the birth or a new baby. You’re tired, your hips ache and you’re having yet another bout of Braxton Hicks. It’s not fun and you can be forgiven for being a little grumpy, but try to be patient with your child. If you find yourself taking your bad mood out on her, immediately apologise and try to reconnect. Give plenty of cuddles, tell her you love her, and have fun playing together. Remember, the impending birth is bound to be stirring up strong emotions in your first born. She might even regress a little, or you might notice a change in her behaviour. And with your patience at an all-time low, this is the perfect recipe for a battle of wills. Try to rise above it, and remember your big child is probably experiencing lots of big emotions she can’t yet vocalise, or even understand. Bear in mind that you’re tired and cranky and so might not be the most fun person to be around either. Try to stay connected, and be loving and patient, no matter how grumpy you both are. Find as many books about pregnancy, birth and babies as you can and add them to your bedtime story collection. There are so many books out there designed to help prepare first born children for life as an older sibling. Give your child the chance to ask questions while you read, and always leave time to chat afterwards. Remember, even a child who seems excited and happy about becoming a big sister can have some reservations about the change. Your child is loved, there’s no doubt about that. But make sure you show her that. Plenty of time for connection in the form of cuddles, kisses and one-on-one time is especially important now there’s a new baby on the way. With a developing baby snuggled up in your bump, your first born probably suddenly seems much older and wiser than she did before. But she’s still little, and she still needs you just as much as the new baby will need you. Don’t hold back on the displays of affection. Instead, embrace showing your child just how much she means to you. One of the first and most important jobs of a big brother or sister is chief present buyer. Getting your child involved in shopping for the new baby helps her to feel included in caring for the new baby. You might want to let your child help pick out the new baby’s first outfit (from a carefully selected choice of items, of course, unless you’re happy with the baby arriving home from hospital dressed as Elsa). You could also give your older child the chance to pick out a present for the new baby. This could be a special teddy that the baby will be able to treasure for years to come. Or it could be something homemade, like a painting for the wall of the nursery. Your child will be able to present this gift to the new baby after the birth, and everyone will be able to gush over what a great big sister she is already. And now you need to go shopping for a present for your first born. After all, becoming a big brother or sister is an occasion which needs to be celebrated. Remember, it doesn’t need to cost the earth or leave you in financial hardship; it just needs to be a little token of love from the new baby to the best big brother or sister in the world. 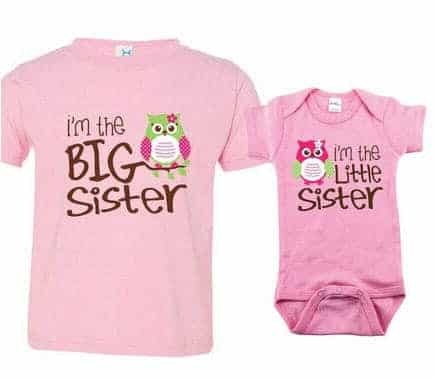 Perhaps a big sister or big brother tee (or other big sibling related gifts like books) might help them feel extra special about their new role. Recommended Reading: If you’re preparing for the birth of your second baby, be sure to read this great BellyBelly article: 7 Parenting Toolbox Tricks For When Baby #2 Comes Along and a beautiful article about Loving Two Children (get the tissues! ).